We bring onward to our customers an exhaustive range of Color Coated Steel Coils that are manufactured by using optimum quality stainless steel that is acquired from trusted sources of the industry. These Color Coated Steel Coils are available with us various colours and dimensions. We provide a comprehensive range of Color Coated Coils, which have strength of steel, corrosion resistance of metallic coating and an additional corrosion protection. These are provided by us in various dimensions and colors as required by the clients. These are made using superior grade stainless steel, and are preferred in the industry for their exceptional features. We are devoted towards offering the qualitative range of Color Coated Roll, as per client’s precise need and requirements. We are indulged in trading, supplying, dealing and wholesaling Color Coated Coil. 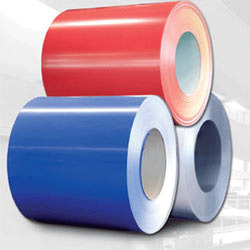 We take pleasure in introducing ourselves as leading firm by offering Color Coated Steel Coil. 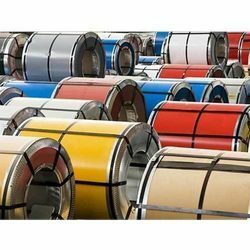 Backed by huge industry experience and market understanding, we are involved in providing a wide variety of Color Coated Steel Coils for our valued patrons. We are dealing Galvanized Color Coated Steel Coil. Yield strength (MPA) : 240, 340 ,550. Owing to the vast acquaintance, our firm is competent to present Green Color Coated Roll. Our customers can avail this product as per their requirements. Color: Available in white, green, yellow, etc. With enriched industrial experience, we have been able to offer a wide spectrum of Galvanized Color Coated Steel Roll.